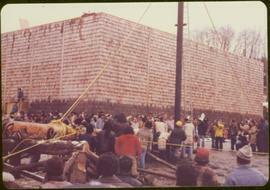 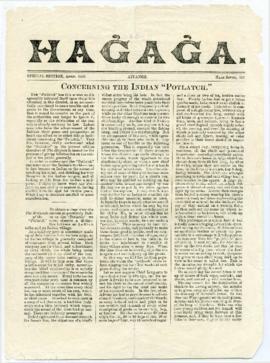 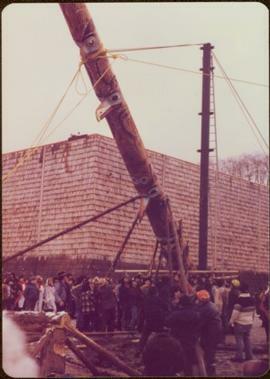 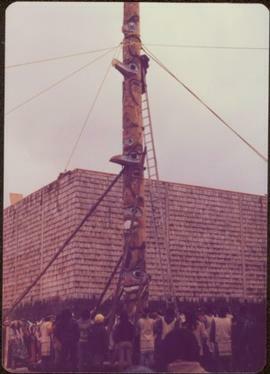 Handwritten annotation accompanying photograph reads: “Nisgaa Pole raising, Tait, Aiyansh”. 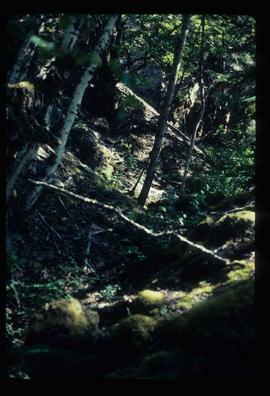 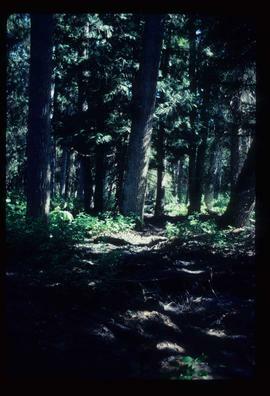 Image depicts a forested area located somewhere near the Tseax Lava Flow. 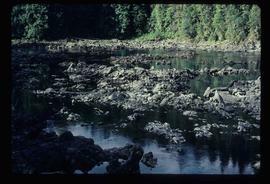 Image depicts the Kiteen River at Dragon Lake near Aiyansh, B.C. 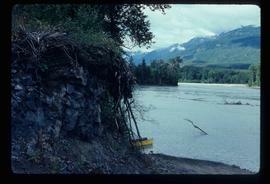 Image depicts a camper on the shore of what is possibly Melita Lake, near the Tseax Cone. 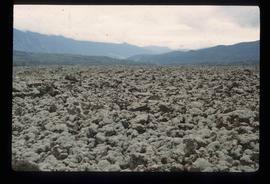 Image depicts what is possibly Tseax Cone, the volcano responsible for the existence of the Tseax lava flow. 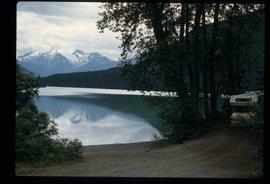 Melita Lake is possibly in the foreground. 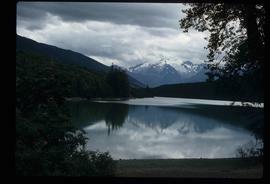 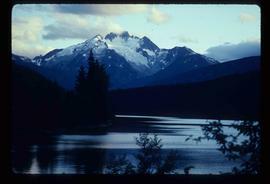 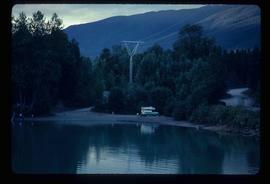 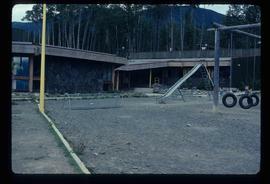 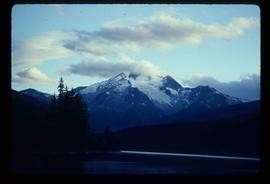 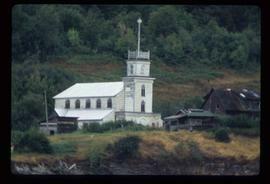 They are located in Nisga'a Provincial Park near Aiyansh, B.C. 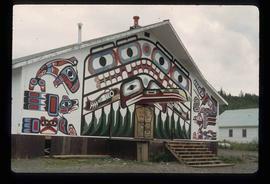 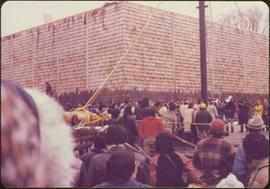 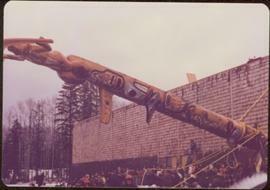 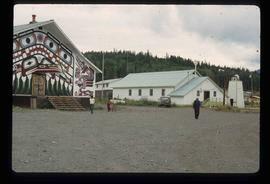 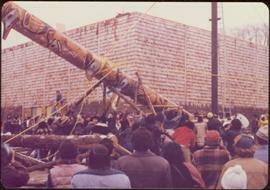 Image depicts a building painted with First Nations art in New Aiyansh. 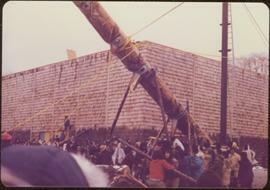 Image depicts a view of Old Aiyansh. 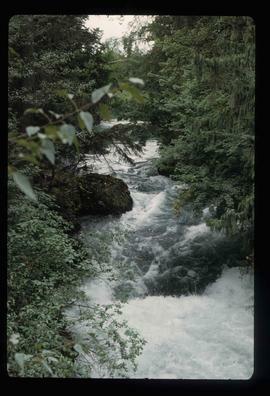 Image depicts what is possibly a section of the Tseax River. 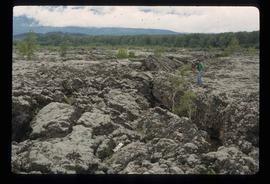 Image depicts the Tseax Lava Flow. 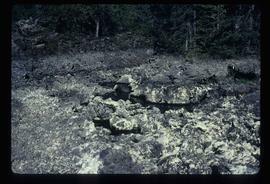 Image depicts an unknown individual standing on the Tseax Lava Flow. 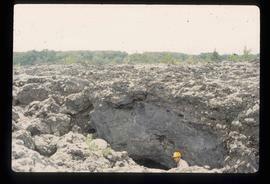 Image depicts Kent Sedgwick standing in a drainage tunnel of the Tseax Lava Flow. 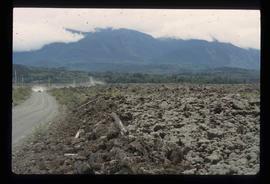 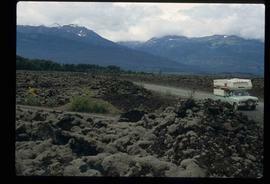 Image depicts the Tseax Lava Flow, with mountains in the distance. 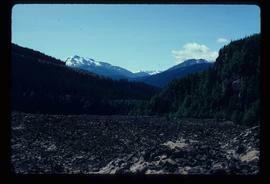 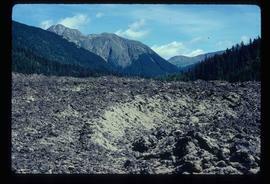 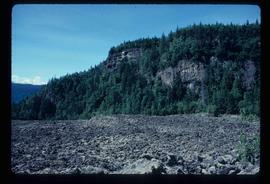 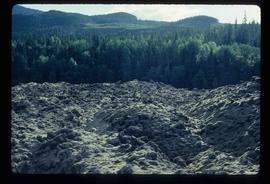 Image depicts old lava cliffs and the Tseax Lava Flow in Nisga'a Provincial Park, near New Aiyansh, B.C. 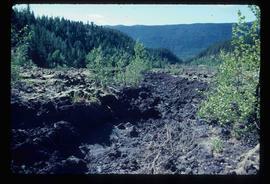 Image depicts the Tseax Lava Flow. 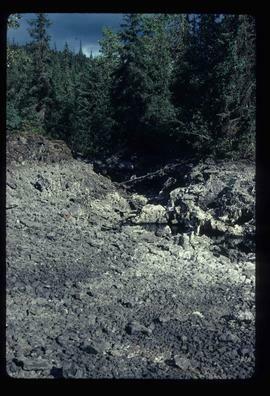 The slide is labelled "pressure ridges." 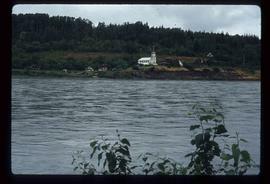 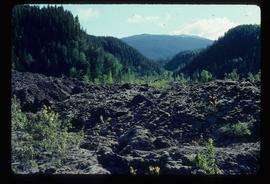 Image depicts a shallow river running over and through the Tseax lava flow. 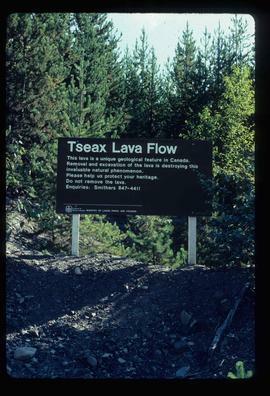 Image depicts a sign at the Tseax Lava Flow asking people to not remove lava from the site. 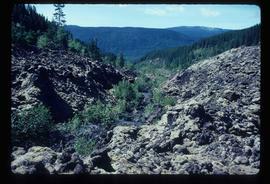 Image depicts a stream running through the Tseax lava flow. 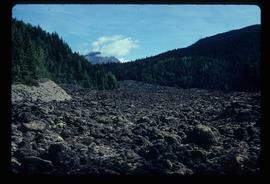 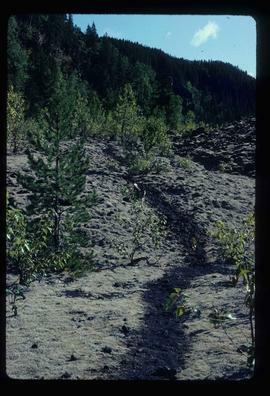 Image depicts the Tseax Lava Flow, looking up valley. 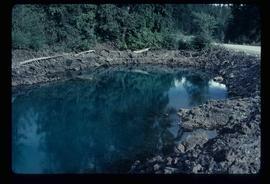 Image depicts what appears to be a small pond near the Tseax lava flow. 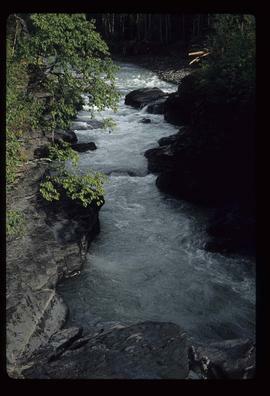 Image depicts the Tseax River.